Wednesday, December 17 through Saturday, December 20, 2014-Tucson, Arizona: Kit and I enjoyed a very nice, but all too short visit, with our Tucson family. 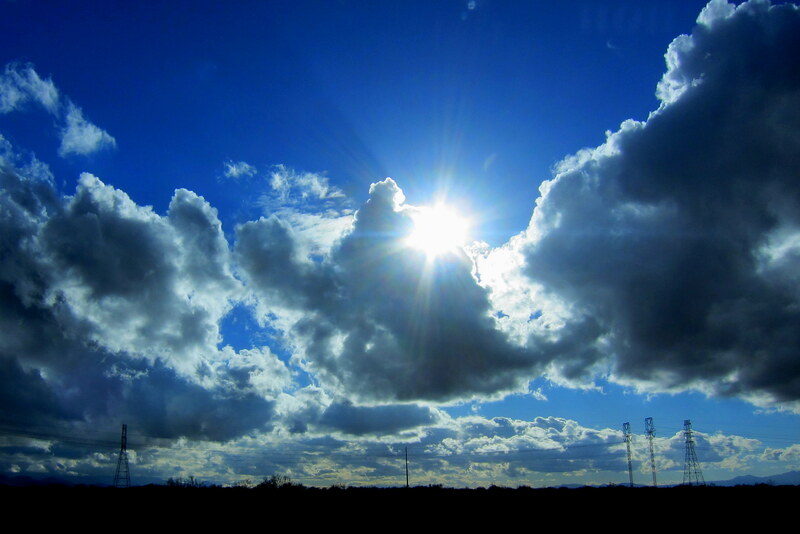 The weather was great, well except for one afternoon when it rained…..really hard! 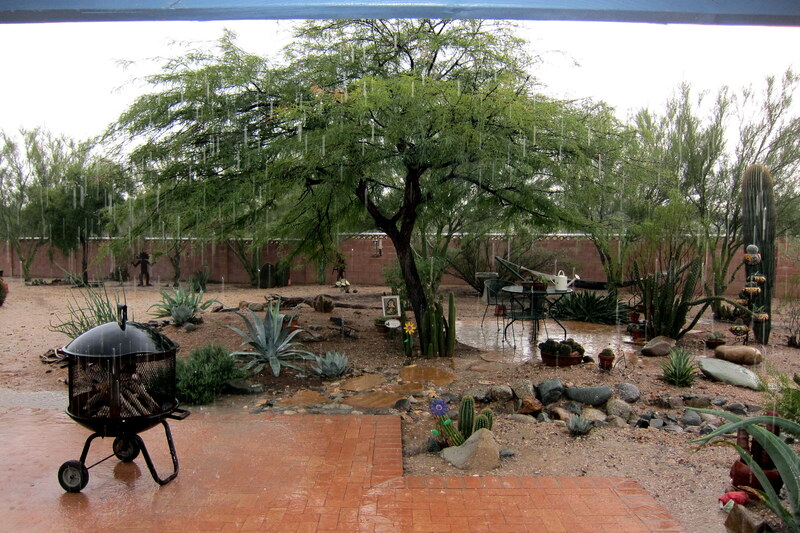 When it rains in the desert, folks go bananas! Kinda like New Englanders do when the crocuses push up through the snow and signal spring is forthcoming. It’s a rare and welcome event! The proprietors of the exclusive Doobie RV Resort are the consummate host, with the able assistance of their three staff members. 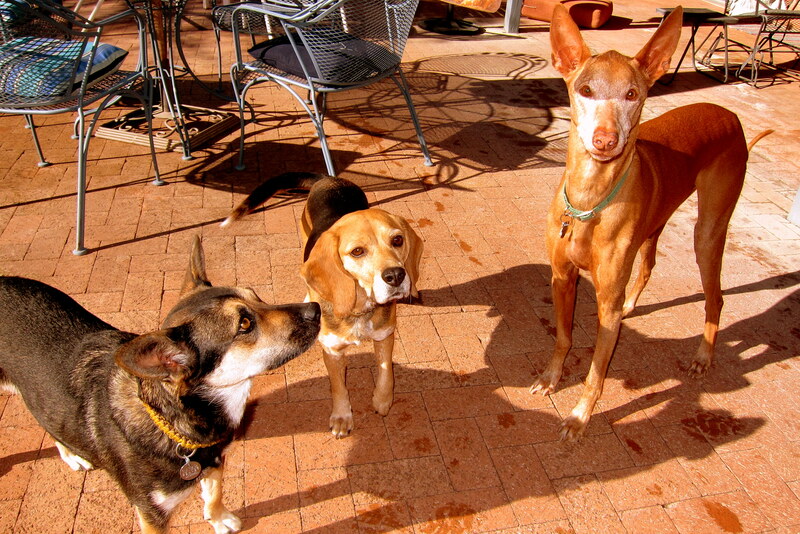 Kali, Pillito, and Nile are the brains behind the organization, and can be counted on for handling any spill or dropped food…..anytime, anywhere! Dooryard surfing is one of our favorite camping styles while on Excellent Adventure trips. And staying in Dewey and Bea’s dooryard is a true pleasure! Not only is the price right, but we are basically their next door neighbor. We can enjoy visiting when appropriate or give them some quiet time when needed. Being fully self-contained we pride ourselves in being unobtrusive and low impact as possible. Customarily we treat our dooryard host to a nice meal out so the entire stay is a true win-win situation for all. Speaking of food, during our short visit in Tucson we were able to hit most of our favorite restaurants and experienced a new one as well. 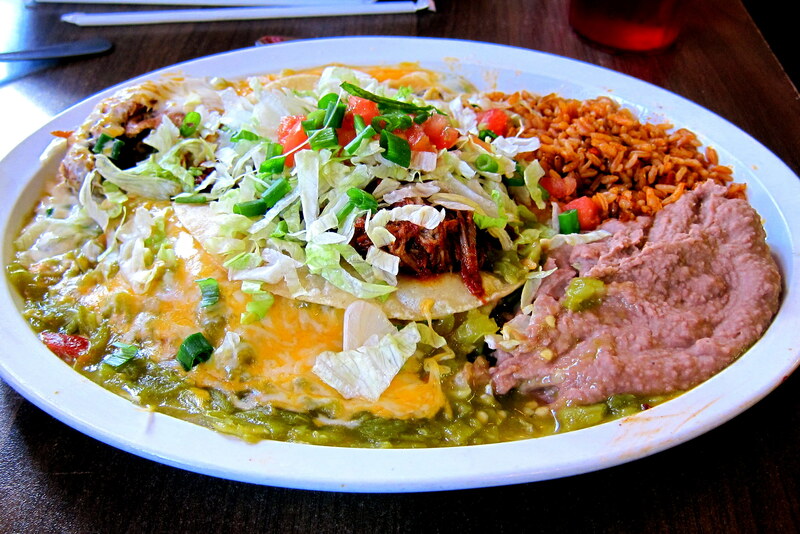 Poco and Mom’s is located in the older part of the city and features original Mexican fare in the New Mexico style. The portions are large, the prices are reasonable and the food is outstanding! 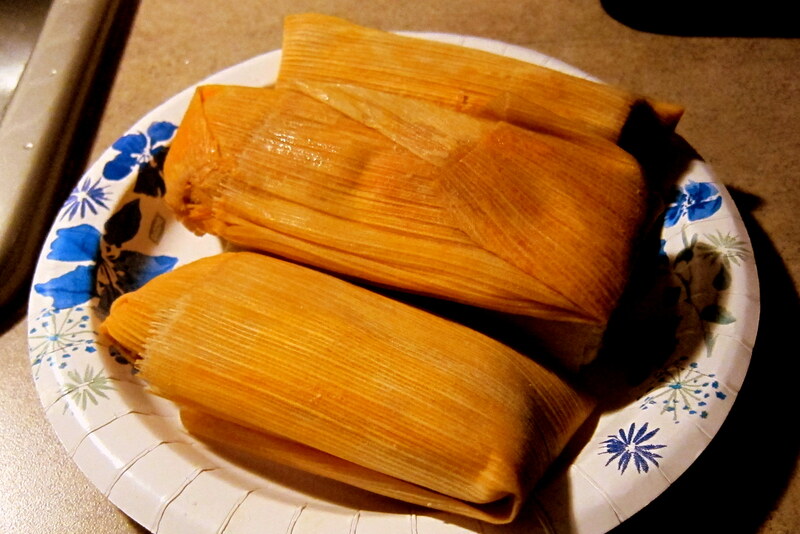 In our opinion, no area of the country does Mexican as well as the folks in the Southwest….go figure! 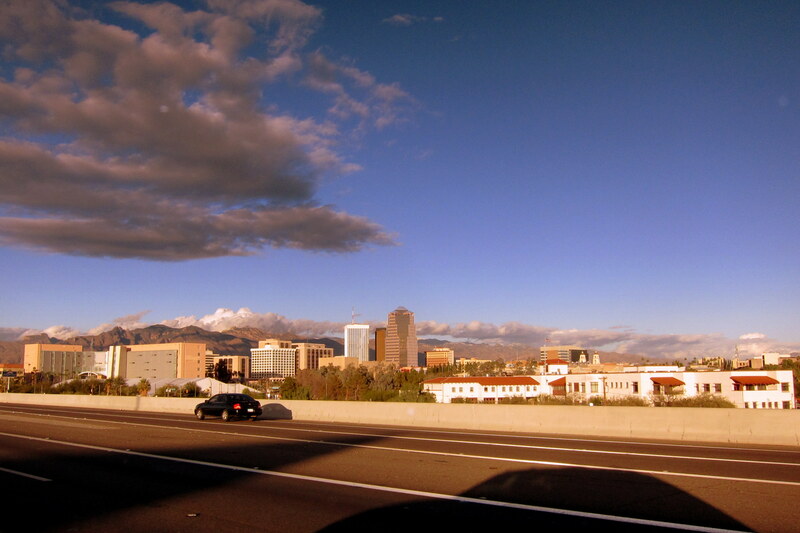 While driving about this very large city of 589,000 souls, one is constantly reminded that even at 2,643 feet elevation, Tucson is in a valley and surrounded by five mountain ranges with summits over 9,000 feet! The city has a fair number of characters…..one of which has been an institution on a particular street corner for a number of years. I’ve dubbed the old fellow “Newspaper Guy”. 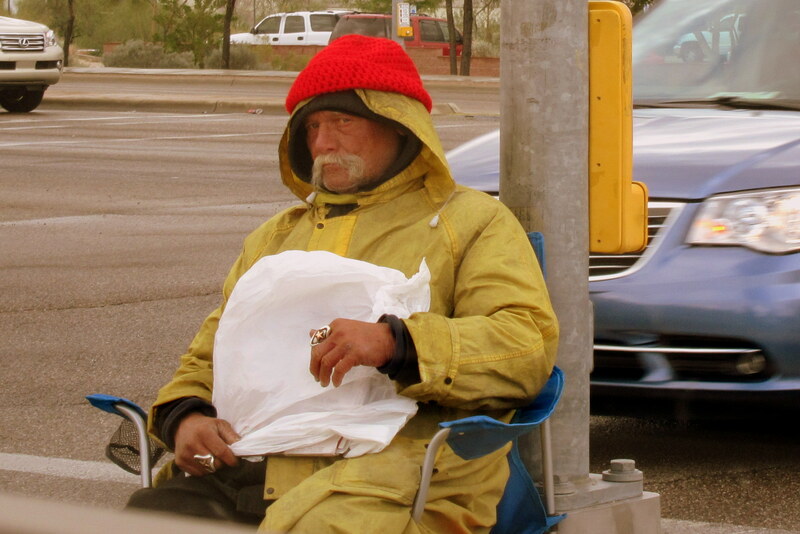 Rain or shine, hot or cold, he dutifully sits on his bundled up possessions and sells the daily paper to drivers by. Gotta admire Newspaper Guys work ethic…..he could be sitting home collecting welfare, but would rather be out making his way on his own terms. We never purchase a paper from him, but frequently hand Newspaper Guy a few bucks if the traffic signal timing allows. 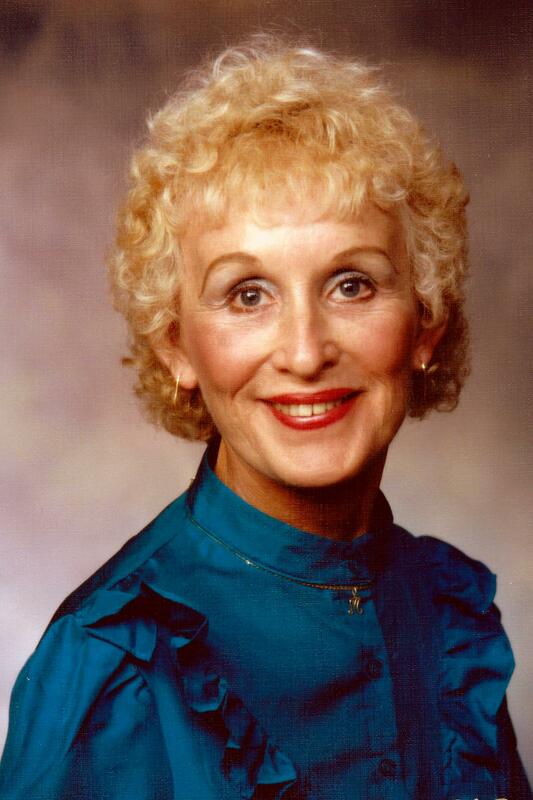 Readers of this journal may remember that my mother passed into God’s hands last March. The matriarch of our unconventional Tucson tribe was mother/step-mother and step mother-in-law…..Miriam Theresa Byrnes Herndon Russell. Kit and I, along with many of mom’s family scattered about the US, have spent the past 9 months recognizing her life by way of celebrations in areas of the country she loved best. Shortly after her passing, we ensured her place at Fort Rosecrans National Cemetery which overlooks San Diego Bay and many US Navy installations. An honor mom earned in service to her country during World War Two. Then in May we returned her to Philadelphia, the place of her birth. There we honored mom, her birth mother, and her infant brother at an old city catholic cemetery. Now, she is returning to Tucson in order to be reunited with her favorite husband Dean. 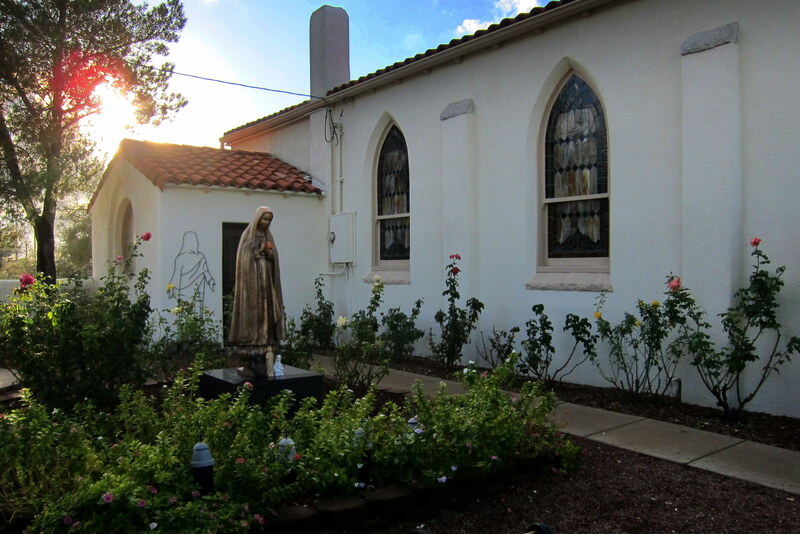 At her request, mom and dean will now have a presence in the rose garden of Saint Rita’s of the Desert in Vail, Arizona. As the Tucson family gathered around, each spoke a few words of remembrance and shared stories of mom’s impact on their lives. Mom and Dean then found their way beneath the earth where they will be watched over by the Virgin Mary and many of the Lord’s beautiful flowers. 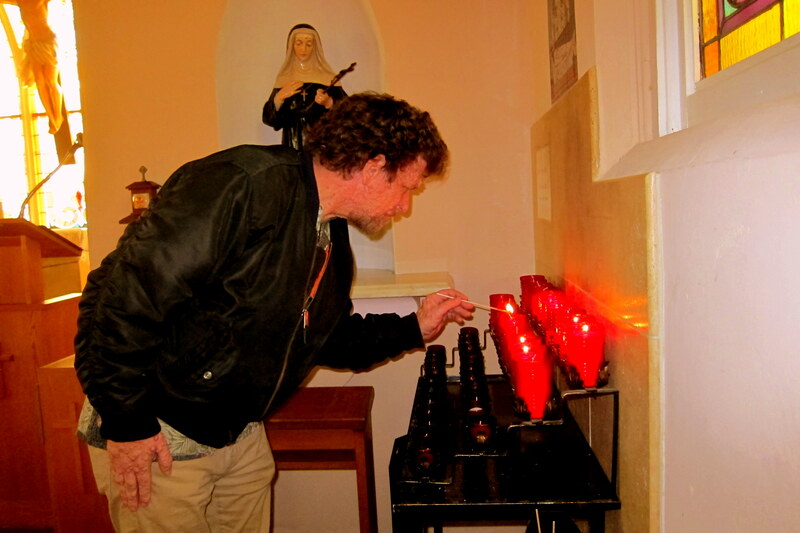 After the service, brother Dan lit two votive candles in the chapel in remembrance of his mother and stepfather. 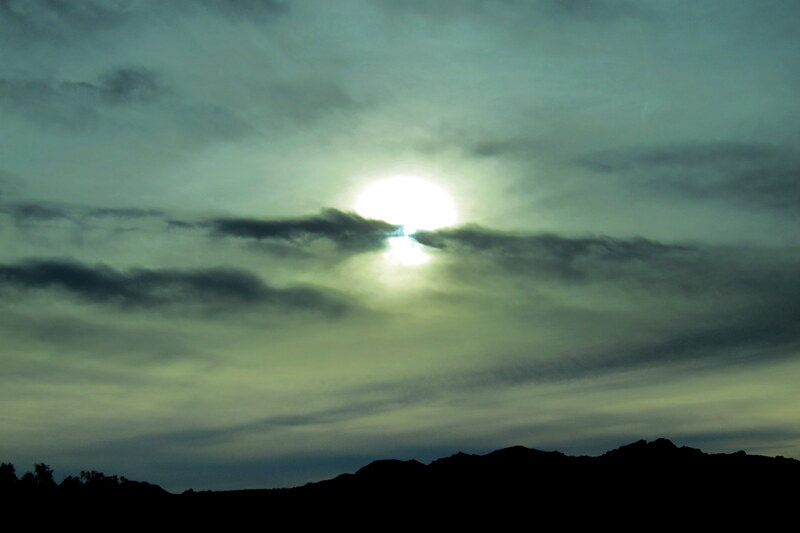 As we pulled away from the church grounds, the sun peaked from behind the clouds. And everything was alright with our little corner of the world. The final celebration of life, complete with military honors, will take place in a few months at Fort Rosecrans National Cemetery. Back in town, we enjoyed a celebratory dinner in our mother’s memory at one of her favorite restaurants while toasting her with a favorite cocktail. As we were enjoying the meal and fellowship, I happened to notice old Saint Nick at the bar, enjoying an adult beverage. 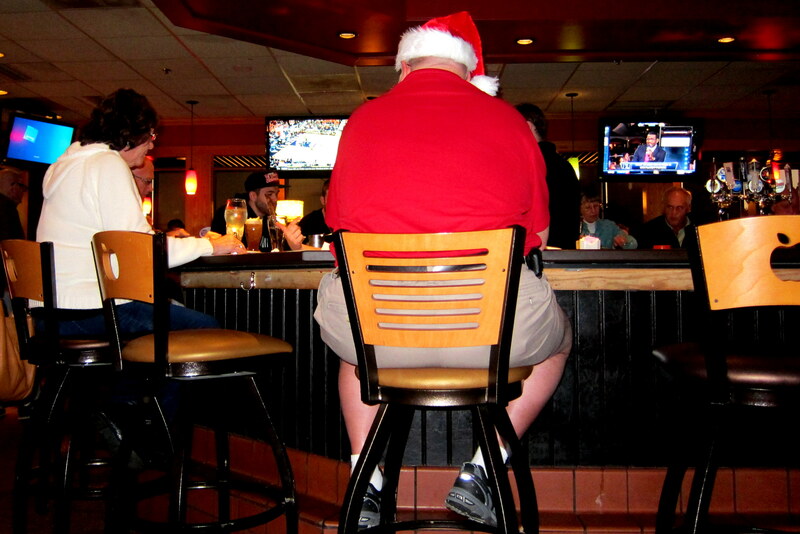 Soon, a family with young children entered the restaurant and the young’uns immediately ran up to the old guy yelling “Santa, Santa!” The portly and white bearded Bar Stool Santa stayed in character and spoke kindly to the wide eyed children…..it was a touching, and somewhat bizarre, scene! The day before we departed Tucson, Dewey and Bea held a Christmas Open House for their friends and neighbors. Many of these folks we have met in the past and it was great seeing them all again. 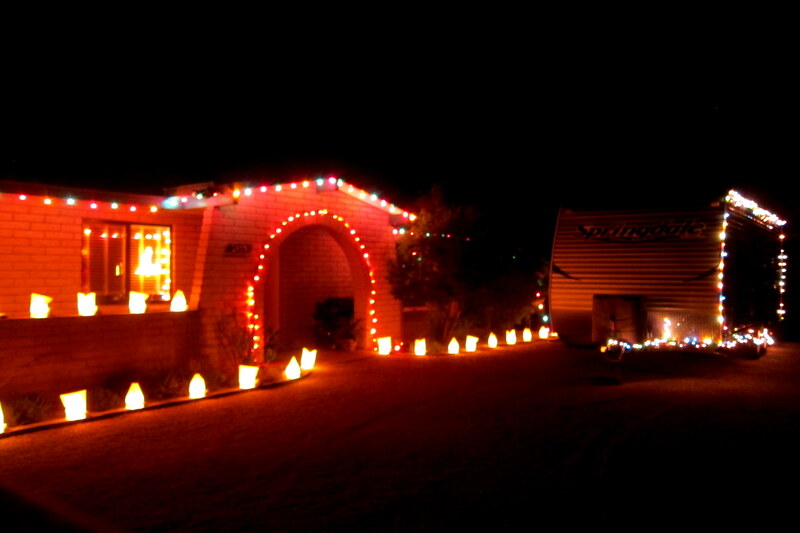 As night descended on one of our favorite camping spots I took a walk around the grounds to experience the warm Arizona evening and enjoy the many Christmas lights and luminaries that Dewey and Bea had on display. Living in Maine for the past 30 years, it is still somewhat jarring to view Christmas decorations while dressed in shorts and sandals! Sunday, December 21, 2014: Woke to sunny skies and cooler temperatures. 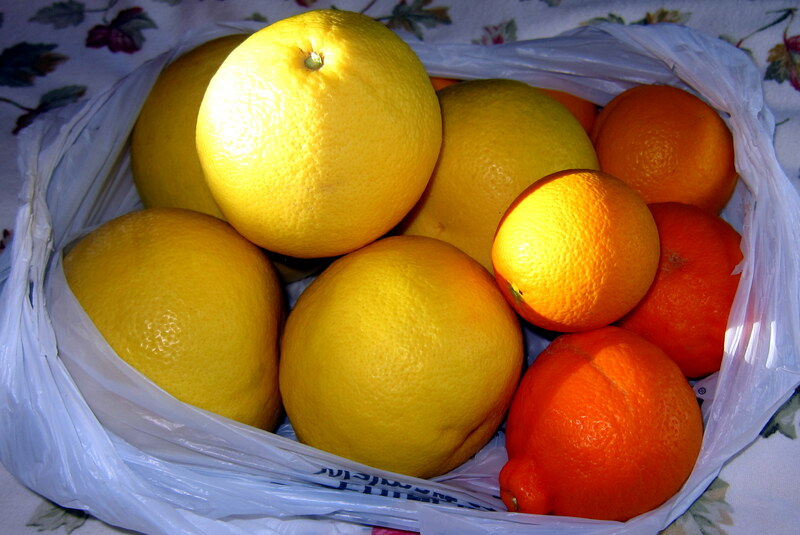 While prepping our camper for departure I came across a large bag of freshly picked citrus hanging from a bracket on the trailer. This very welcome surprise has become an annual tradition. The thoughtful gift was from Dewey and Bea’s friend and neighbor Manny, who has become one of our friends as well. 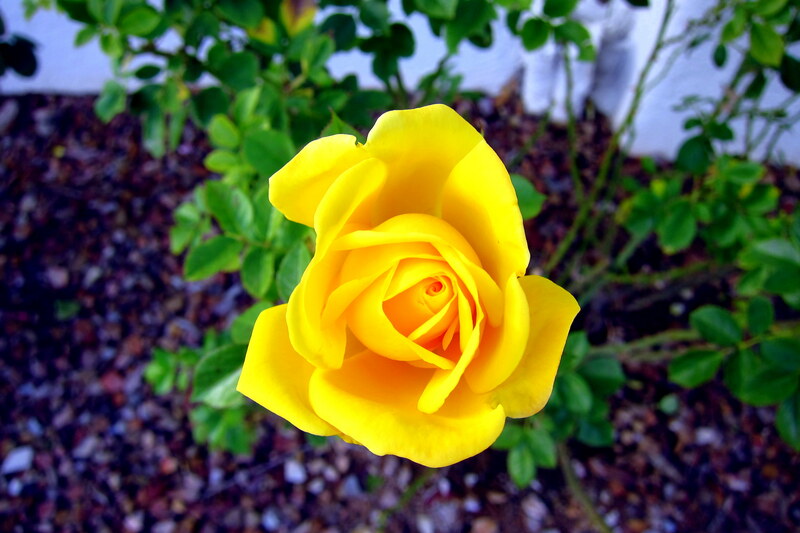 He is an avid gardener and tends to a nice grove of citrus trees in his backyard. A generous man, Manny shares his bounty with folks throughout the growing season and we always look forward to his largess. Following a great breakfast prepared by Dewey and Bea, Kit and I were back on the road heading north. 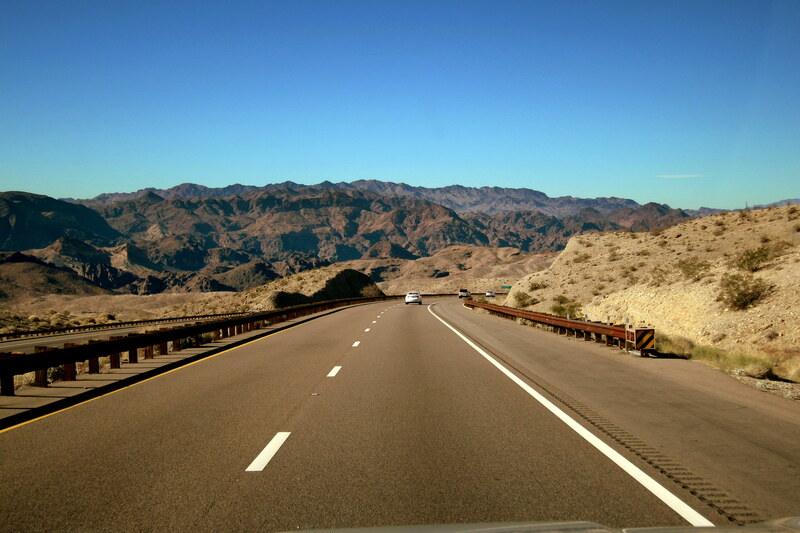 Once again we are on I-10, which in the part of Arizona heads more northerly and made tracks toward the state of Nevada. Let’s face it; Interstate Highway driving can be boring and somewhat tedious. 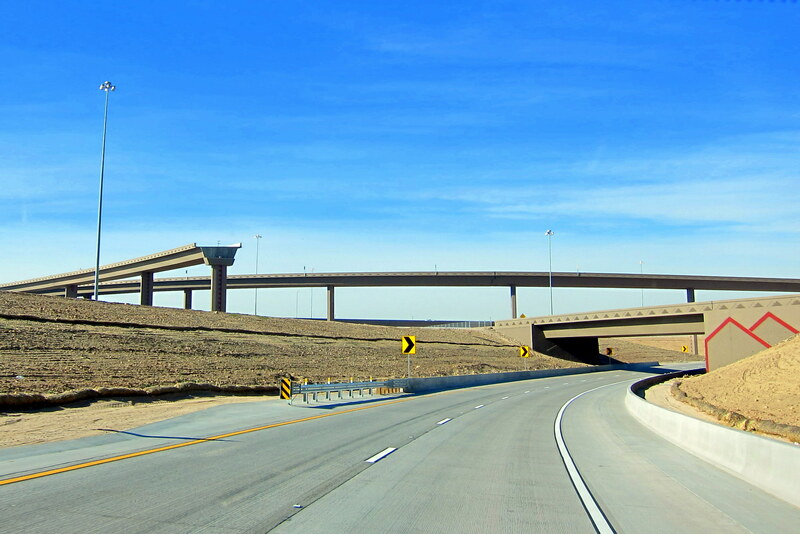 Our preferred travel roads are US or State highways and secondary roads. 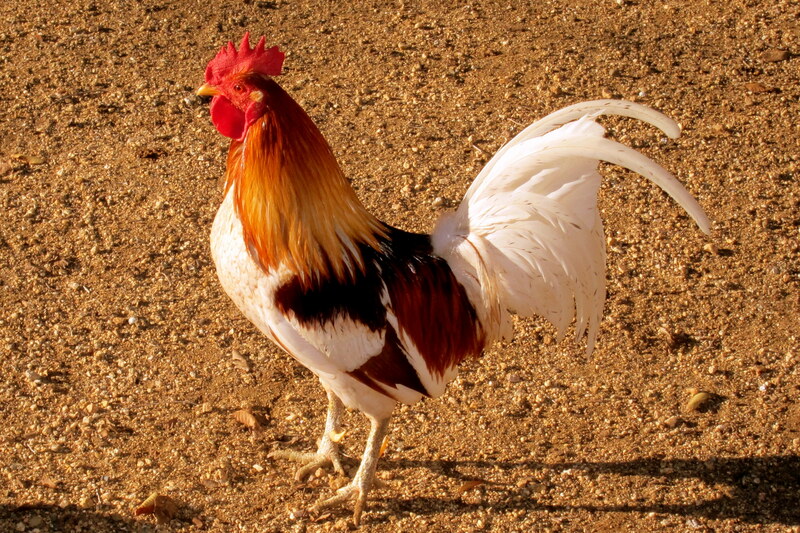 They historically provide the most diversity in terrain, roadside sights and quirky characters. However the interstates do allow for relatively safe and rapid movement through an area that has little exploration value or an area one may have explored in the past. 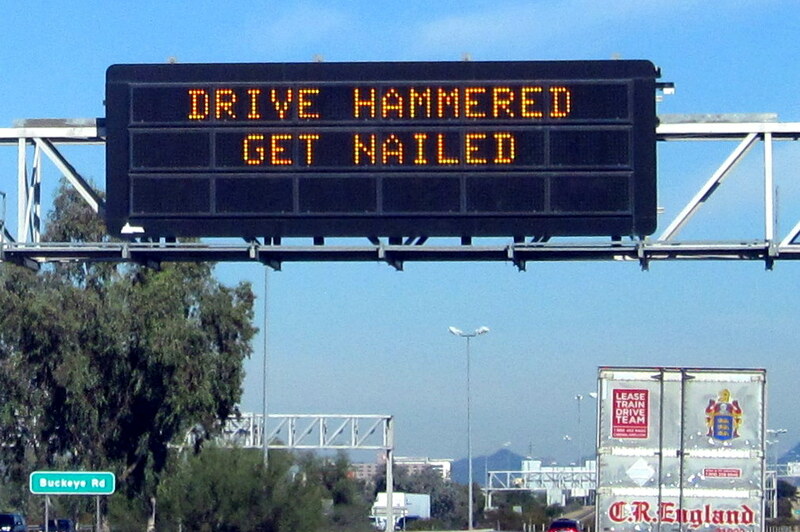 In addition, there are occasionally some clever road-signs…..like this one spotted just south of Phoenix. 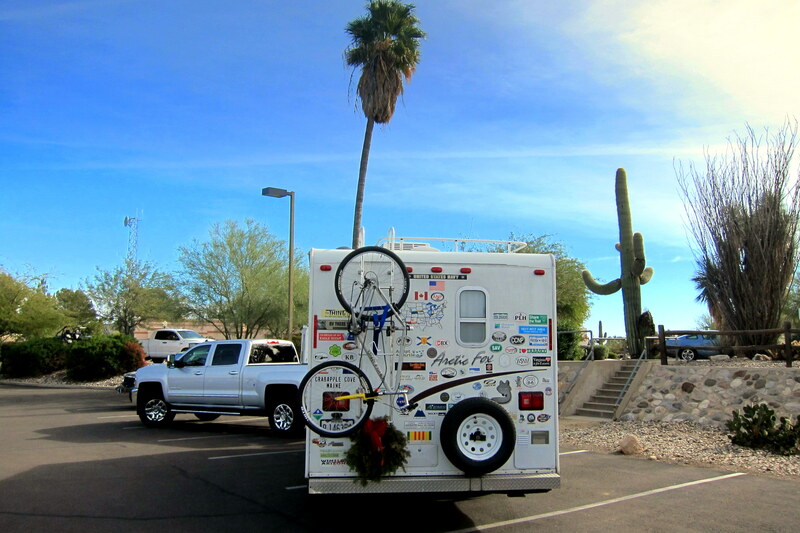 Lucy had us staying on I-10, and then transferring to US-60 through the heart of Phoenix. However Kit ever vigilant on her iPad noticed a new loop to the west that would bypass most of the congestion and join US-60 north of the city. AZ-303 is still under construction but useable enough for our purposes. We just had to make sure we adhere to the “Road Closed” signs or the trip could come to an abrupt and rather startling end! 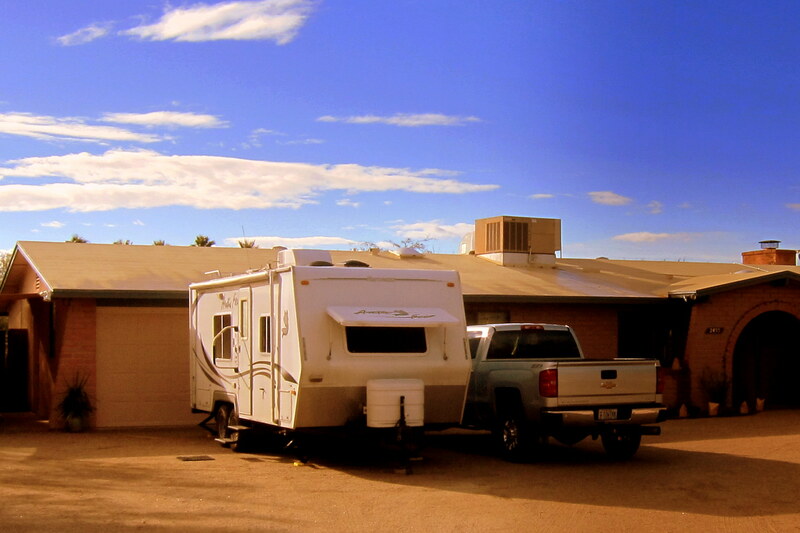 Joining US-60, we meandered north toward Wickenburg where we stopped for a lunch break and some walking about time. After a nice camper prepared meal, Kit and I strolled into the small downtown area. 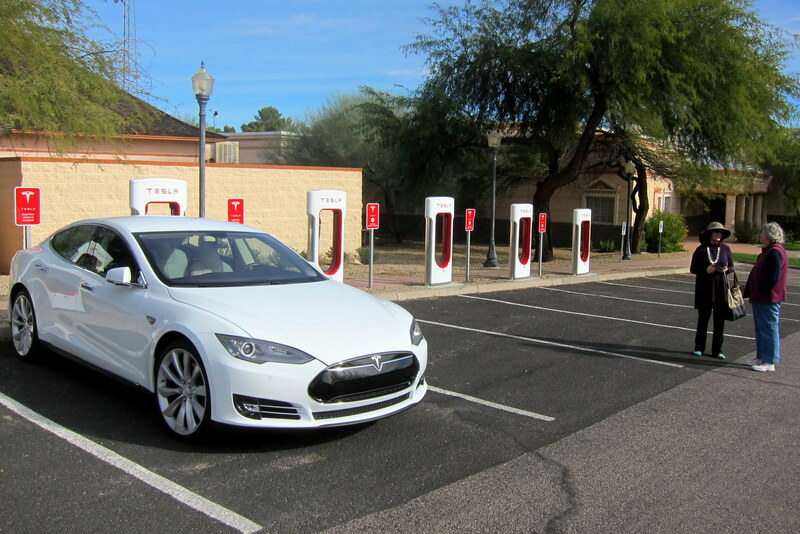 As we passed the municipal office complex, there was a row of Electric Vehicle (EV) charging stations with a Tesla Model S tethered to one of them. These sites are starting to pop up all over the west as EV’s become more popular. Many are being installed by Elon Musk and his company, Tesla Motors. I find it somewhat ironic that the shape of the charging stations resemble gasoline fuel pump’s….by design or by coincidence, it strikes me as hilarious! As I was photographing the Tesla, a woman came out of the municipal office and introduced herself as its owner. Bonnie is a recently retired agent from the Department of Homeland Security and lives in Henderson, Nevada…..just a short distance from Las Vegas. She shared with us the logistical complications of taking a road trip in an all-electric automobile…..only one of which is replenishing the batteries every couple hundred miles. The Tesla features a large touchscreen in the center stack that looks like an iPad. This screen displays much of the information that a driver or passenger may need. In addition it is wirelessly (um, obviously) connected to the internet and an app locates the nearest charging opportunity. The stations that Tesla Motors has installed will recharge a partially depleted battery array in about 30 minutes…..enough time for an adequate rest break. 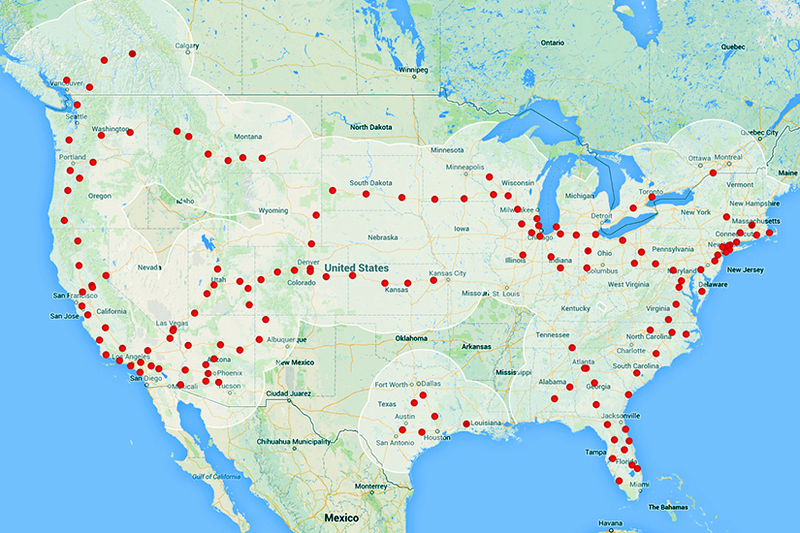 There are plans to install these Tesla Supercharging Stations throughout the US at appropriate distances. Currently many of these stations are concentrated on the west and east coast as indicated on the following photo I took from my new drone. Other needs of the EV driver, such as restrooms, may not be as available as they would be for the rest of the motoring public. So, Tesla has partnered with (read donated money to) various cities and towns to locate their charging stations in municipal parking lots as this provides access to the buildings restroom facilities. Oh, and if you own a Tesla…..there is no charge for the electricity! 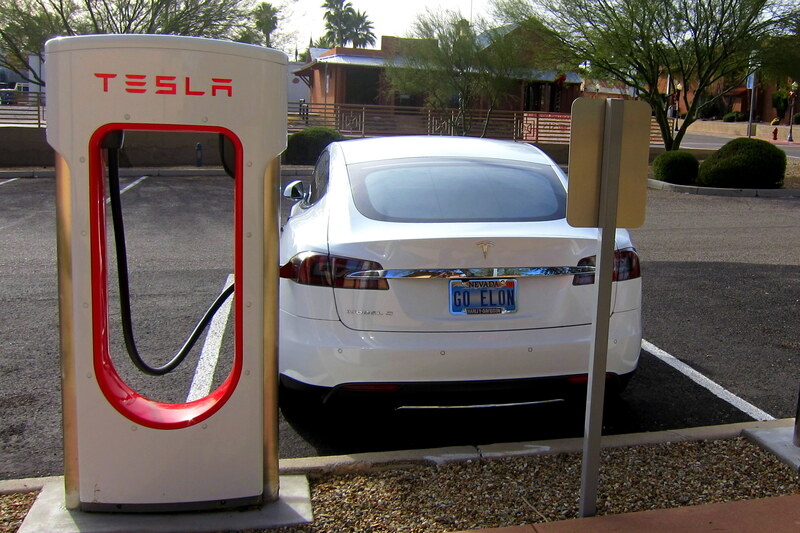 Yes, Bonnie and her Tesla was the most interesting thing in Wickenburg, Arizona so we continued on. Once underway, we moved from US highway-60 onto US-93 and resumed heading north. Soon we were passing through a very small no-horse town! 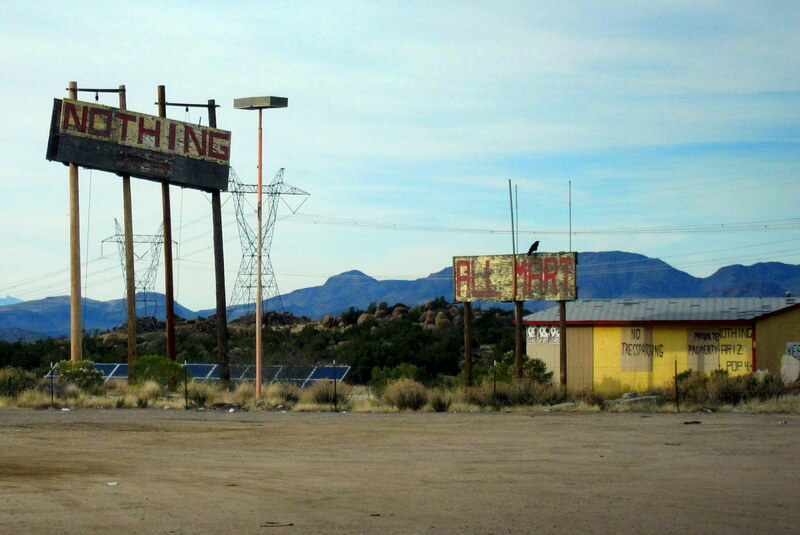 Yep, Nothing, Arizona has, well…..nothing! Last year there was a small outpost in that yellow building, but now even that is gone. The only sign of life was a Dingo scampering about. As we watched the sun sink below the western horizon, it was clear that we would not make Las Vegas tonight. So we rolled past Kingman and made it to Chloride, Arizona for the evening. 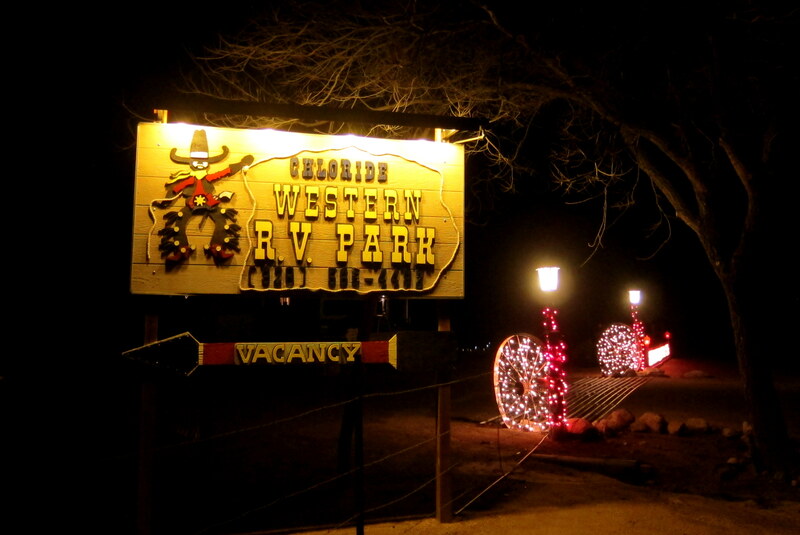 Pulling in after dark we checked into the Chloride Western RV Ranch. Monday, December 22, 2014: As the sun rose over the mountains, the campgrounds alarm sounded calling all lazy folks to wake up and get to work. One of the interesting things about pulling into a campground after dark, in addition to parking by braille, is to wake up and peek out the window. This morning as Kit and I took in the view over coffee, we decided that Chloride demanded a closer look. And since we were only 90 miles from our next destination we decided to delay our departure in order to poke around a bit. For breakfast we enjoyed some eggs along with the homemade tamale’s Bea had presented us for our journey. Once again, Mexican food in the southwest is better than anywhere else in the US…..and if it’s homemade in the true Mexican tradition it is absolutely incredible! Filling our bellies, we walked into town along the narrow two lane road in search of adventure. Chloride, founded in 1863, is nestled at 4,000 feet in a pocket of the Cerbat Mountain Range. 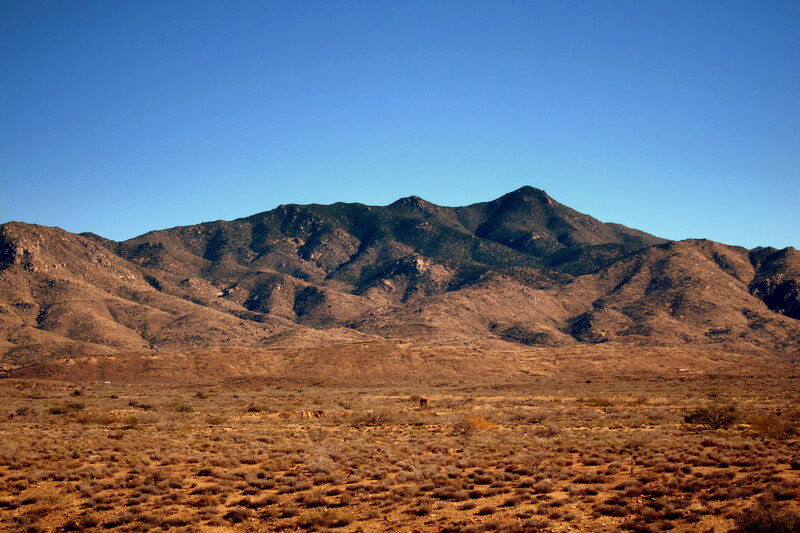 There is a population of about 150 folks living year round in this high desert environment. 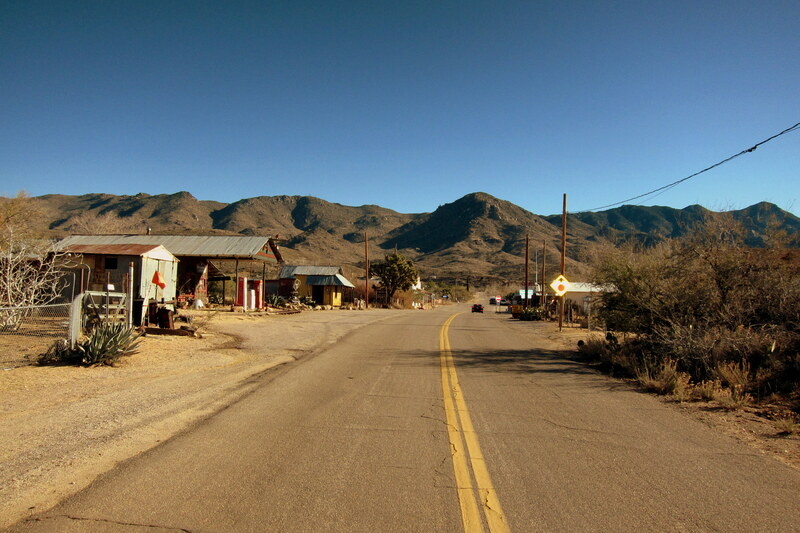 The town derives its name from the mining of Silver Chloride, which is used in photograph developing and processing. The residents are friendly and a bit quirky, many being refugees from the 1960’s Counterculture Movement. Most delight in creating “Yard Art” on their property…..but unlike the yard art of rural Maine, these rusting castoffs are strewn about with artistic intent. The style of abode that folks around here live in are as unique as the residents themselves. 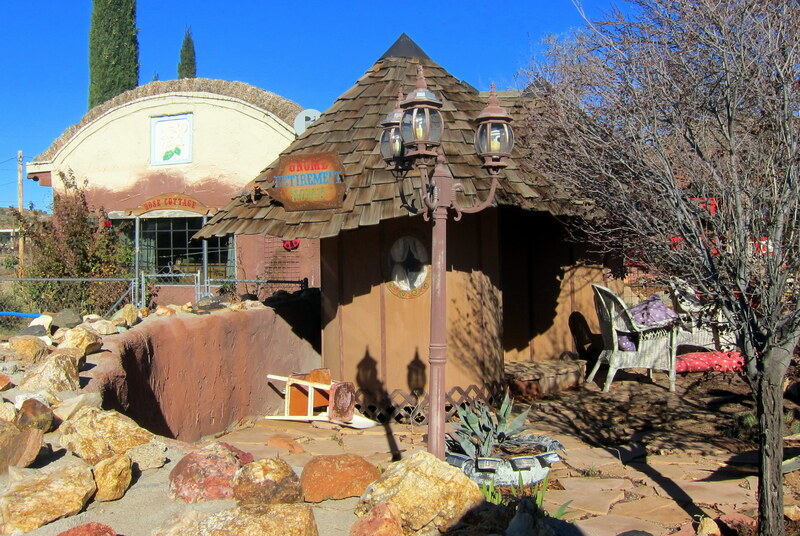 The adobe home to the left has a roof made from prairie grasses, and the one to the right features cedar shakes. 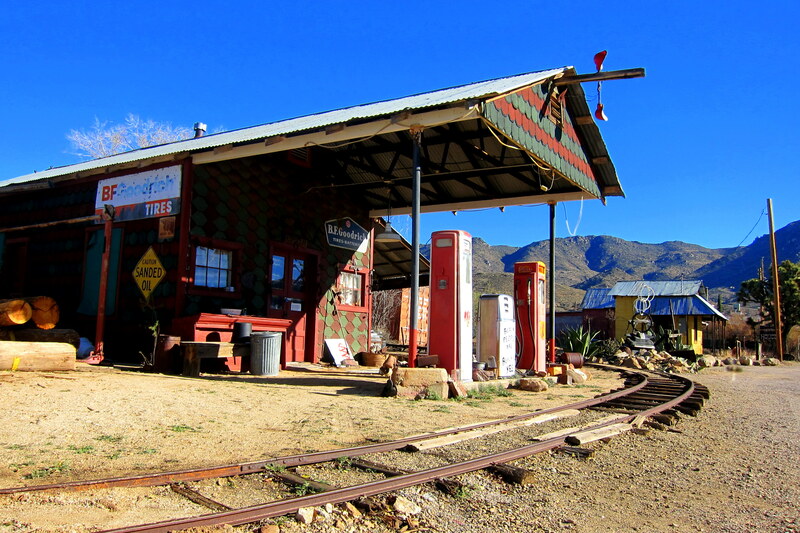 And down the road a piece resides this antique service station that has been repurposed into someone’s home. Following precedent, the owner has filled his unkempt yard with relics from the days of motoring past. And, as a nod to the regions mining past, has encircled his property with tracks from an abandoned mine’s railway. There were a few ore railcars on the track but no sign of a locomotive……or of the owner for that matter. My imagination did detect two beady eyes and a double barreled shotgun muzzle behind the dirty window pane however. 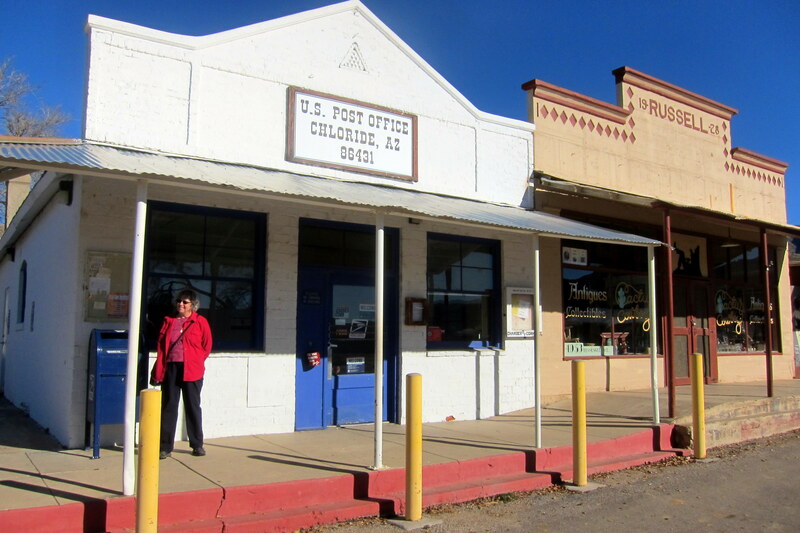 The Chloride Post Office is purported to be the oldest continuously operating post office in the state. Walking in we stumbled upon the very haggard post mistress trying to handle the large pre-Christmas volume of mail. We chatted for a bit then left her to the task at hand. 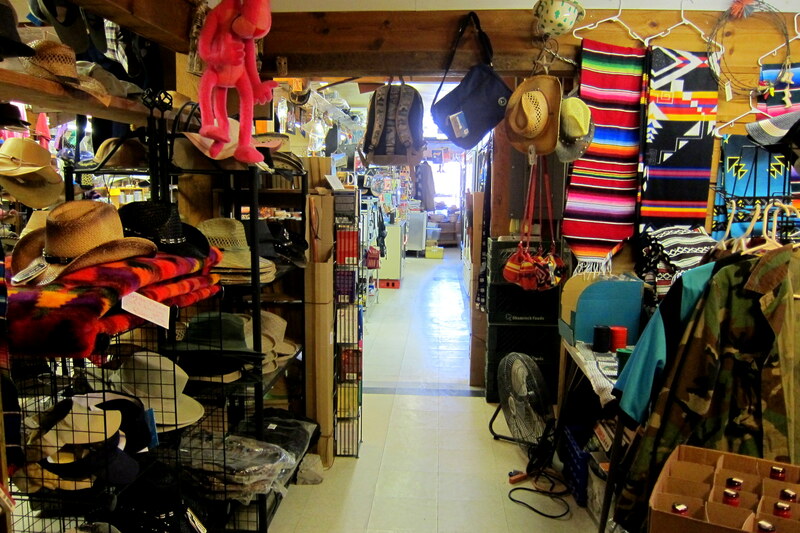 The towns’ general store contained, as most rural stores do, anything and everything the folks who have dropped off the edge of civilization could want…..and if they don’t have it in stock, then you don’t need it. The shop mistress was sporting a pair of reindeer horns…..not wanting to insult her lineage, I tried not to stare. Too late; I was caught…..she pointed to her nice rack she asked “know what this means?” Afraid to utter a word I froze as the middle aged woman blurted out “I woke up a bit horny this morning!” And for the first time in my life I was speechless. 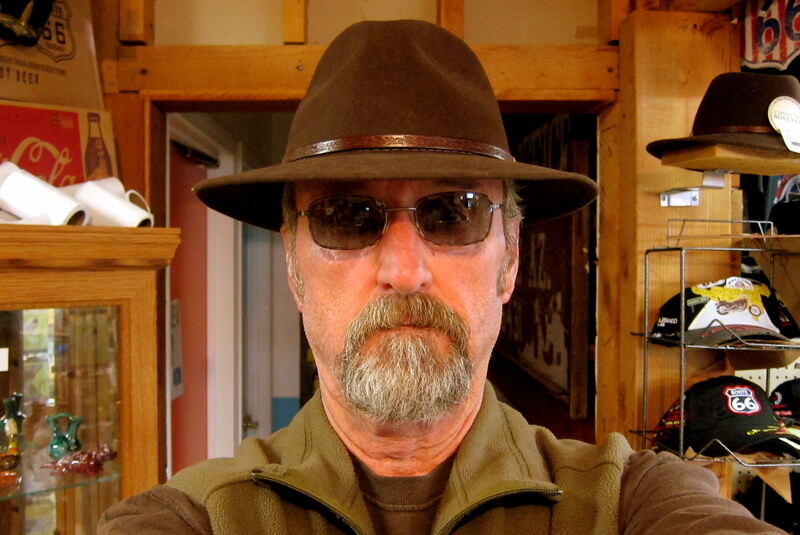 That encounter helps illustrate the type of characters that inhabit the town of Chloride. 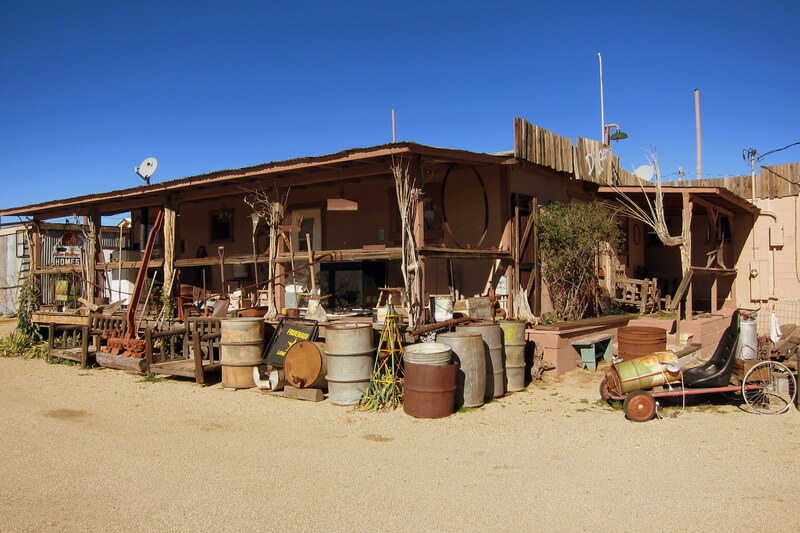 Even the tourists start acting like the locals, such as this bizarre looking derelict. Nearing noon, we made it back to the trailer, broke camp and headed for an old homestead that the horny shopkeeper had told us about. 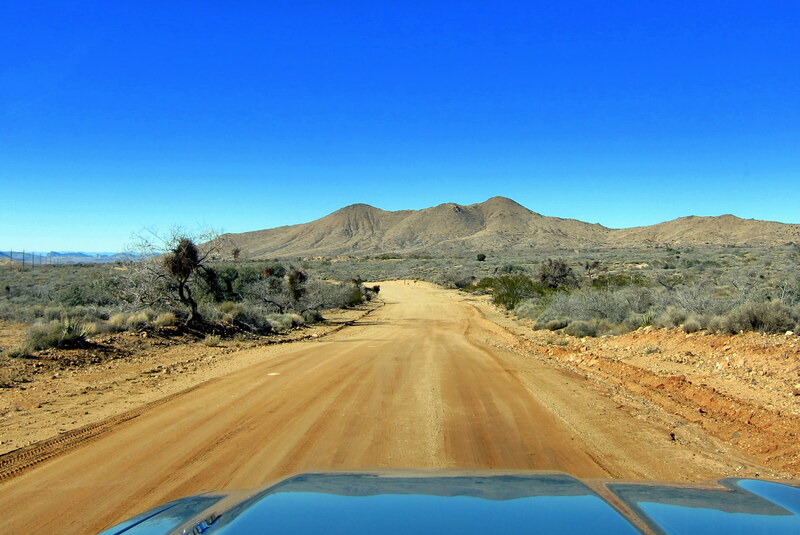 Allowing our new truck to experience its first taste of travel on a dirt road we pulled off the two-lane and headed north through the tulles’. Meandering along in search of the abandoned home, we noticed a grove of the famed Joshua tree’s (J-tree) growing along the roadside. These Doctor Seuss looking trees primarily grow in the higher elevations of the Mojave Desert. The J-tree was given that name by 19th century Mormons due to the tree’s unique shape which reminded them of the biblical Joshua raising his hands in prayer. Growing in clusters, the J-tree features a root system that can travel over 35 feet in search of ground water. Unlike many plants, the J-tree is pollinated by the Yucca Moth in much the same way bees pollinate more common plants. 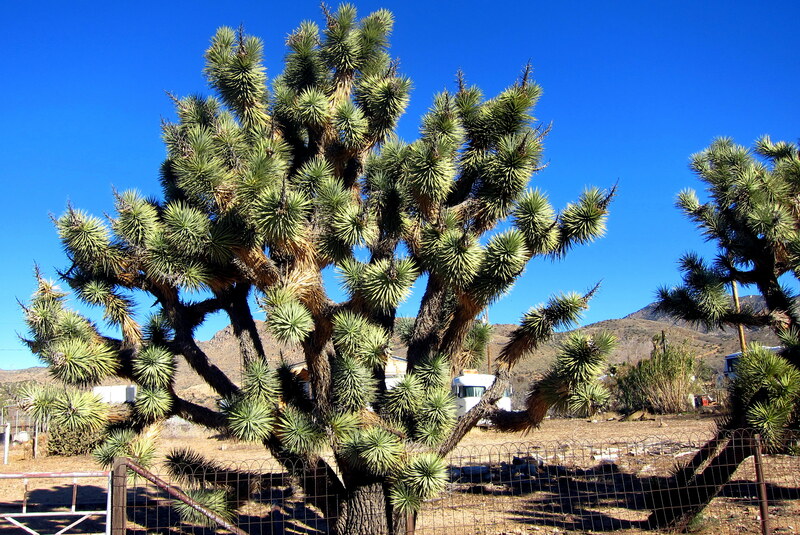 Native Americans used the J-tree as a food source and as material for basket weaving. A couple of miles further down the road we spotted the legendary house made of stone, which had celebrated an unusual and storied past. As the legend goes, this sturdily built home was constructed using local materials by a former sailor. The seaman, after many years in the service of the early US Navy began having these reoccurring nightmares about drowning at sea. Taking that as an omen, he resigned his commission and headed inland and far away from the ocean. Settling in the new mining boomtown of Chloride, the old sailor filed a claim on a rather prosperous vein of silver and built this stone house to the envy of other less successful miners. One day, while working the mine, a monsoon hit, a flash flood ensued, and yep…..you guessed it, he drowned! Following the tenets of early western property inheritance, his land was up for grabs. A local acquired the land by outgunning his opponent and opened a business on the site called The House of the Soiled Dove. Within the stone walls, women of questionable virtue would entertain the wealthy miners and ranchers. However, a few years later the mines had played out and the establishment was closed. 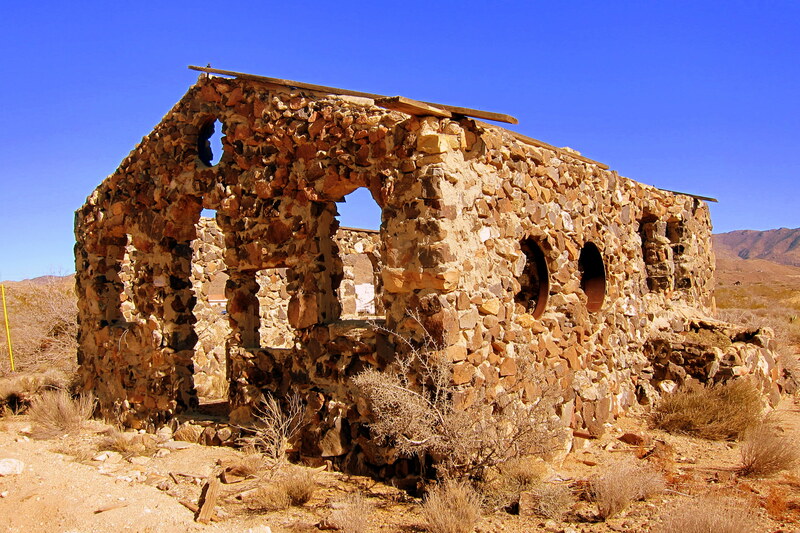 Next the stone house was repurposed as a Christian Chapel to minister to the Native Peoples spiritual needs. Yep, western history can be very interesting! Continuing on the dirt road for a number of miles we eventually reconnected with US-93 and headed to the north paralleling the Cerbat Mountains. As we approached the Pat Tillman Bridge that will take us high above the Colorado River, we began to descend out of the mountains. Crossing into Nevada and stopping for a rest break in Searchlight we discovered the only casualty of those miles on the rough dirt roads of Chloride. As back road RV’rs and ocean cruising sailors can attest, very little stays where you originally place it while traveling. In the past, we’ve experienced total chaos on rough roads when every cabinet door has swung open and most of the contents spilled onto the floor……so, this was indeed very minor! By early afternoon we were checked into Oasis RV in exciting Las Vegas, Nevada and looking forward to a great visit with our youngest grandchildren and their parents…..stay tuned!! Kit’s Bit’s: For my always quick witted husband, this truly was a “speechless” moment for him! I witnessed the whole thing and he was certainly taken aback, for a few seconds. Even then, he couldn’t come up with a witty comment! It was definitely a “first” for him. On the positive side, his mom would have loved this incident, as they shared the same sort of humor! About 8-10 newbies came to the SAGE open house tonight at what will be our last such dance workshop for many months as we take chase to catch up with you in far west. At 2 degrees, I fear we waited a little too long to get underway but in a few hours we leave this chilly region and are anxious to reconnect with you again in warmer climates. Keep an eye out in your rear view mirror and we’ll get there! Great turnout for a workshop class…..bet the place was jumping! Kit and I are excited to follow your RV adventure and look forward to camping together at some point. Take care, stay safe, and please keep in touch!! 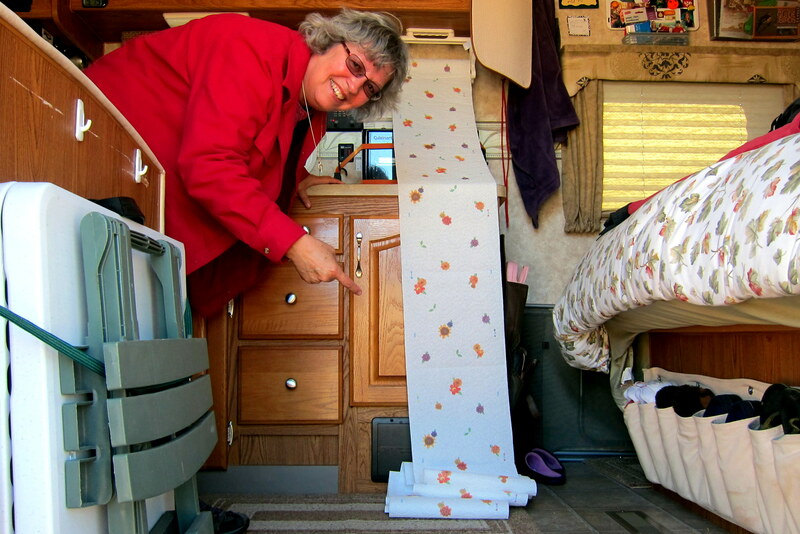 OK, WHERE DO YOU FIND THAT WIDE FLOWERED TOILET TISSUE.KIT??? GREAT PICTURE OF THE BRIDGE TO NOWHERE, I THOUGHT THAT WAS IN ALASKA WILLY!!! NEXT TIME YOUR IN CHLORIDE BILL, BRING A BOX OF VIAGRA WITH YA AND CALL HER BLUFF!!! JUST KIDDEN KIT. JUST BACK FROM A THREE DAY DUCK HUNT IN SALISBURY MASS, SOME FRIGID, NOT THAT MANY DUCKS DUE TO THE SEVERE COLD, THEY MOVED FURTHER SOUTH. LOOKING FORWARD TO SEEING THE NEW CAMPER. 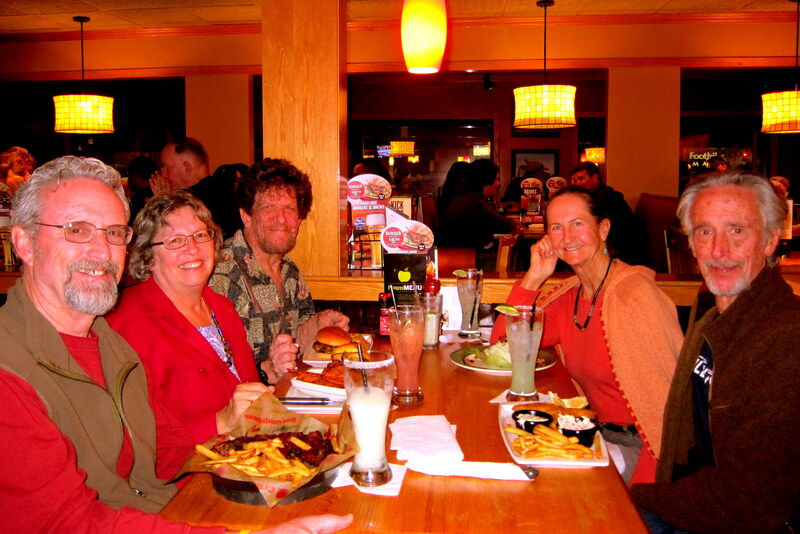 WENT TO A MOVIE AND DINNER WITH WINDY AND NANCY LAST WEEK. Hey folks, great to see the cold isn’t keeping you indoors! Take care and think spring!! Sounds like we overlapped in Tucson around December 19-20. Too bad we did not get to meet up. Wait, do you have a new, 397 horsepower silver ice metallic Chevrolet Silverado 3500 4×4, SLT, ZR1, with standard pick-up bed, chrome aluminum wheels, Duramax 6.6 liter turbo diesel, Allison 1000 Six Speed transmission with tow mode, and heavy duty trailering package? If so, I think that was you who nearly ran us off the road. Your stories and pictures are great fun, but how about providing a map of your wanderings? Um, maybe…..we run so many cars off the road it’s hard to tell. Did the offending truck sport Michelin 285-75R17, M&S, 8 Ply Radial’s? 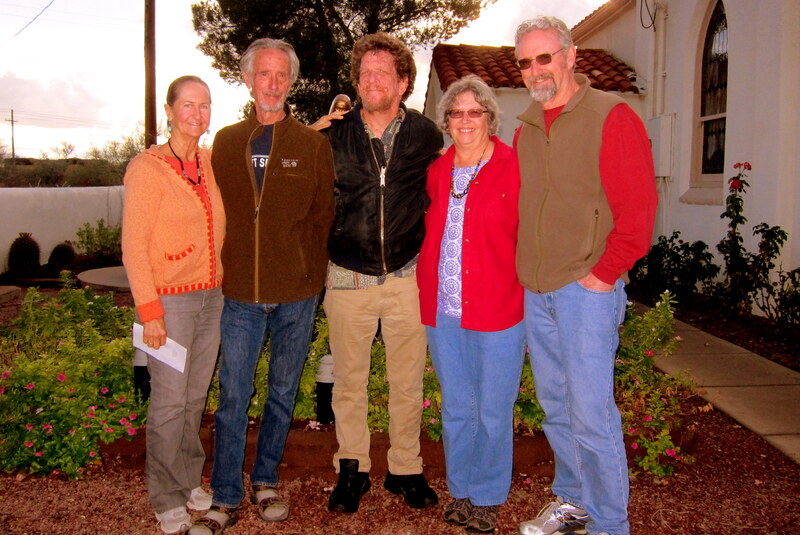 Would have been fun to meet up in Tucson with you guys……hope you had a great time! Thanks for the nice comment concerning the journal, I’ve been looking for an app that plots our meanderings and can be imported into the website…..so far, no luck.